Being locked out of your commercial property is not only a major nuisance, but can also deal a blow to the day’s business and throw your schedule out of whack. If your business is located in Bogota, NJ, though, you don’t have to worry - Bogota Locksmith Store can have your locks open and give you back access to your property before you know it. We have handled innumerable commercial lockouts over the years, so our locksmiths know what they are doing and can assist you quickly and effectively. What types of lockouts can we help you with? 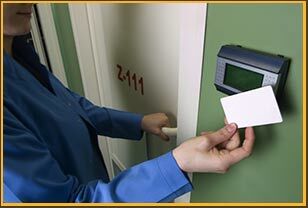 Entry doors unlocked: We can open entry doors, including the ones secured by electronic locks, with ease. We will replace or repair the lock on it after we’re done, if necessary. Garage doors unlocked: Garage doors can go off-track or out-of-alignment. Our locksmiths can get it working again quickly. Mailboxes: We can maintain your mailbox lock and, if necessary, get it open for you. File cabinets: Locked file cabinets don’t pose much challenge for our experts. Safes: Safes, depending on the type, can be opened easily enough. Sometimes we have to saw or drill them open, though. We endeavor to cause absolutely no damage to your precious property or possessions while we work. For example, if you’ve been locked out of a safe, we can attempt to open it for you without damaging it or the lock. If that doesn’t work, in rare cases, we can saw it open without damaging any of the possessions inside. If you hire amateurs to handle commercial lockouts , you could end up regretting it, especially if they have little experience with opening high-grade or high-security locks. Our commercial locksmiths receive a great deal of training with mock lockout situations, which enables them to handle real ones without too much trouble. We also send them to regular seminars and provide educational material to sharpen their skills. We have helped countless local business owners with commercial lockouts over the years. Need an expert locksmith to deal with a lockout? Contact us now on 201-402-2697 !